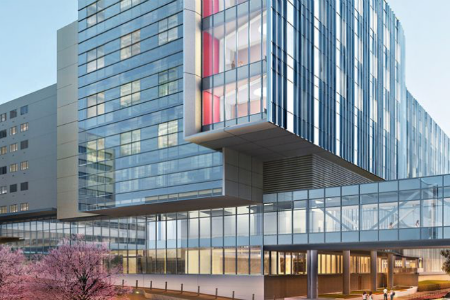 Currently, under construction, the new Advocate Christ Medical Center bed tower aims provide the campus with a world-class center for patient care. Major goals include resolving shortages of clinical space, enhancing patient privacy, increasing patient safety, increasing infection prevention, providing state-of-the-art technologies and improving the overall patient experience. The facility is a Level 1 trauma center and specializes in cardiovascular services, heart and kidney transplantation, neurosciences, oncology, pediatrics and women’s health. This 10-story facility will include 72 intensive care rooms and a number of specialized areas. The Advocate team has employed an Integrated Project Delivery process whereby the entire team (owner, architect, engineer, users, consultants, contractors, etc.) are engaged during the design phase to encourage smart and efficient building planning. For this project, E Cube is providing a comprehensive LEED commissioning process including the Fundamental Cx Prerequisite and Enhanced Cx Credit. Commissioning services include mechanical, building automation, lighting controls, and plumbing domestic water systems.